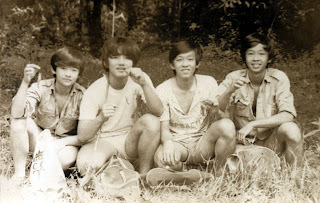 Manage to dig out one of these old photos taken in Kampung Darau, which i think is around 1974. Me on the right with the "gang" is going fishing for prawns along the Darau River. Catch then used to be plentiful - fresh water praws weighing a kilo each is common. You can easily catch crown fish for your home aquarium and during high tide, you can see puffer fish swimming upstream with the tide. A recent check with the kampung friend revealed that the river have been dead for years since agriculture and poultry activities upstream poisoned the river in the late 70's. The catchment area for this river is also lost to development and thus it now only serve as an outlet for rainwater. Sad case.